David206 Wrote: I never turned on Two-Factor Authentication. Too many reports of poor security. Does that mean that my autologout of LP is caused by something else? Oh, damn. I hope it's all the same. How horrible if all our reports are caused by separate bugs..
LP hasn't replied back with what the issue was. But, a pet theory on how we both might have the same bug even though I had 2FA and you didn't: 2FA is activated both by users and by LastPass on their servers. Somehow, LP can activate 2FA on their servers if even you don't have it enabled--sounds like a horrible kind of bug/security issue. They asked me to disable 2FA user-side: I did, deactivating the only 2FA I use (Google Authenticator). 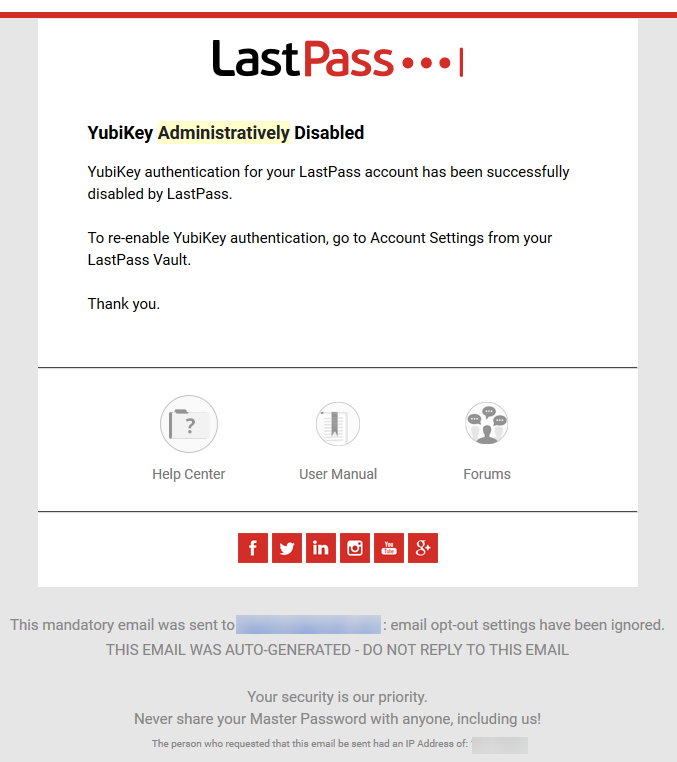 Then I gave them the go-ahead to disable their server-side 2FA..but instead of one server-side deactivation (to match my one user-side deactivation), I actually got three server-side deactivations: Google Authenticator (just deactivated), LastPass Authenticator (deactivated a long time ago), and YubiKey (which I have never used). Maybe they have some rogue server-side 2FA activations going on, i.e., my LastPass session kept waiting for the YubiKey (which I don't have) to be plugged into a USB port when it launched Firefox. Obviously, no YubiKey, so it refused to keep my session logged in? Only a pet theory. I've asked LastPass to clarify just what went wrong and when they'll put out a fix for everyone. I'll ask them, too, about why there were other server-side activations when I never had them in the first place; maybe this has happened to other non-2FA accounts? After weeks and weeks trying to solve this, I read a few posts on here, refreshed Firefox, downloaded LastPass again and bob's yer uncle, everythings fine again. vbblue951 Wrote: After weeks and weeks trying to solve this, I read a few posts on here, refreshed Firefox, downloaded LastPass again and bob's yer uncle, everythings fine again. Good luck with that, did it quite a few times since April and nothing changed. Did it fix it for a while then go bad again or did it never fix it? A couple of times fixed it for a day or two, then back to the problem. The other times, didn't fix at all. victor676 Wrote: A couple of times fixed it for a day or two, then back to the problem. The other times, didn't fix at all. Grrrrrrrr!!!! Guess I'll have to wait and see. Sadly, I have the experience as Victor. Somehow it works for a day or two (which I told the LP reps in my ticket) and then it's back to insanity. For your sake, I hope it lasts and doesn't flip back. 1. The fix has continued to work on my desktop. No updates from LastPass on my last two replies: if this is a universal fix for other users and why it did not carry over to my laptop which is using the same version of Firefox, LastPass, the binary, the same account, the same Firefox Sync, same Windows version, same Microsoft account, same LAN network, same geo-location, etc. I've had the same problem of having to log in to LastPass every time I close Firefox. I've had a support ticket in since June 13, 2018. I've done all the things they suggested to fix the issue but no luck. Today I got this reply from them. ChrisN	The extension has been updated multiple times and we cannot seem to reproduce the issue, including with the previous steps mentioned. With the reduced number of users seeing this issue, unfortunately the bug has been closed as non-reproducible. Apologies for the inconvenience as we cannot detect the issue that's residing on the local side. I find this kind of strange as they told other users in this forum that they could replicate the issue and where working to resolve it. I'm not impressed with the support. I have the paid premium version but will be cancelling it and looking for another password manager. Bumping this back up; I apologize of my lack of updates--insane work month. If people have good alternatives to recommend, please do share. I've already tried 1Password and I've got mixed feelings (does the same thing as LastPass here...but as a feature). Any others? The last solution provided by LastPass did nothing for my laptop. Still just as broken as it was a year ago. I've re-opened the ticket while I shop around. This plain-as-day bug has started to infect the AMO reviews on Firefox, too. Likewise, it's completely false they cannot reproduce it; they've been able to fix one of my systems, so it's clearly something they acknowledge exists. Their response to you was pathetic and cowardly. https://imgur.com/a/eKlevkH = have a read of reviews on AMO that mention this exact bug. This is laughable. Time to abandon ship, as I've also been doing for a month.